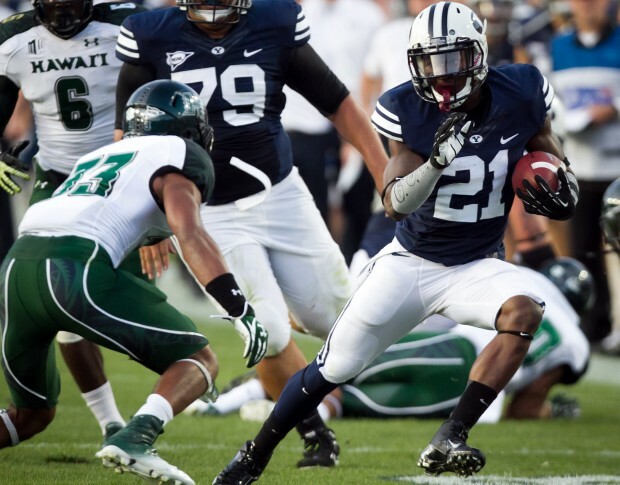 How fast will BYU’s offense be? How is Taysom Hill’s knee? Will the defense dominate like it did in 2013? There are a lot of storylines, but this is a very winnable game for BYU. A home opener against Texas? Quick, Tom Holmoe! Join a conference because Independence will never work! Texas is the best home opener that BYU has had in years. The Longhorns bring a solid team to the field next year. They return 22 players with starting experience, and 17 of those ended the year in the starting lineup. A stellar defense, experienced quarterback play and that famous Texas orange make this a tough game for BYU. The Cougars should hang close for a while, but ultimately, Texas gets the W.
We all remember, the bumper stickers won’t let us forget, Utah beat BYU 54-10 the last time they travelled to Provo. Win or lose, BYU cannot do that again. Things look good on paper for BYU. Utah lost a lot of their biggest playmakers from last year (Star Lotulelei, John White IV, Joe Kruger, DeVonte Christopher) and will be a very young team heading into 2013. Both local teams have a lot of question marks going into the season, but ultimately, the home field advantage of LES and the experience of BYU should be enough to put the Cougars over the top. It’s a rivalry game though, anything can happen. The Cougars will have their third home game in a row against Middle Tennessee State. Just because you’ve never heard of MTSU, doesn’t mean that they aren’t capable. The Blue Raiders were 8-4 last year and are a team on the rise. If BYU doesn’t come ready to play, MTSU could sneak an upset win in Provo. BYU is more talented, has better coaching, and will be at home, however. In my opinion, this will be the best game of the year. The Aggies once again feature the dynamic Chuckie Keeton at quarterback. Though Kerwynn Williams is gone, running back Joe Hill has proven to be a talented successor. Two years ago, Riley Nelson led BYU to a late game comeback win. Last year, Taysom Hill led BYU to a hard fought 6-3 victory. Aggie fans feel BYU got lucky both times and they will do their best to make sure BYU doesn’t get lucky in Logan. Utah State lost their best asset this last year, Gary Andersen, and that is the reason BYU can get over the top. BYU went to Atlanta last year and brought the Jamaal Williams show with them. The Cougars dismantled Georgia Tech and beat them at their own game; running the ball. Williams went for four scores and forced ESPN announcers to remind us he was just 17 with each and every carry. Georgia Tech will be much more prepared for Williams this time around. The game is in Provo, BYU traditionally does well against the option-run, and the Cougars won easily on the road last year, so this game should be in the bag, right? Well, “not so fast my friend.” This game will be close. The location of this game has yet to be announced. I know BYU loves to play games at Jerry Jones’ Deathstar, but I’m not sure a BYU vs. Houston match-up is a big enough draw to fill the stands. Nevertheless, the game will be played somewhere. Houston is coming off a 5-7 season and struggled more and more as the season went on. This is a game that BYU should win easily regardless of where it’s played. Boise State comes to Provo. This game, as Tom Holmoe put it, seems destined to be on ESPN. I’d be willing to bet October 26 turns into October 25. Not much to break down here, two evenly matched teams battling for bragging rights and regional pride. If BYU isn’t wearing their royal blue throw backs or a new all black jersey for this game, then there will be protest. This game will be a big statement game for BYU nationally. Gary Andersen hated playing BYU when he was at Utah State. He snuck out a win against a bad BYU team in Logan in 2010, but was unable to top the Cougars during the rest of his time as the Aggie head coach. Now, Andersen will be playing the same BYU team, with Big Ten talent. Wisconsin isn’t quite as dominant as they’ve been in years past, but this game gets ugly for the Cougars. Many fans talk about how we got Riley’d in South Bend last year. If Riley would have just completed one pass, we wouldn’t have had to watch the Irish get destroyed in the National Championship. The Irish lose the offensive players that killed BYU most (Cierre Wood and Tyler Eiffert) and lose the all-too-controversial Manti Te’o. Notre Dame will not be as good as they were last year, although head coach Brian Kelly seems capable of reloading quickly. Unfortunately for the Cougars, it’s still Notre Dame, it’s still South Bend and it’s a big Thanksgiving game. The homer in me wants to say BYU wins. Prediction: Notre Dame wins by ten.. the homer in me lost. It’s a homecoming farewell for Kyle Van Noy. The dynamic linebacker gets to go home to play his last regular season game for BYU. Last time Nevada played BYU, Colin Kaepernick ran all over the field and John Bender took out all of his childhood frustrations on the backside of Romney Fuga’s knee. No chance BYU (more specifically, KVN) let’s Nevada upset the Cougars this time.